Wageningen University’s School of Social Sciences (WASS) will be offering a PhD course in May and June 2017 called Gender and Diversity in Sustainable Development. Bettina Bock and Jessica Duncan, both from RSO, will lecture in this course. This course will be a seminar. We will take a highly interactive learner-centered approach that combines short lectures with group-based learning activity and discussion. A series of instructors with gender and diversity expertise from WUR and other universities will discuss the relevance of the themes discussed in our class to their own domains. The WASS PhD Masterclass on methods is full! You can no longer subscribe for it. Of course you are welcome to attend the public lecture. We have invited dr. 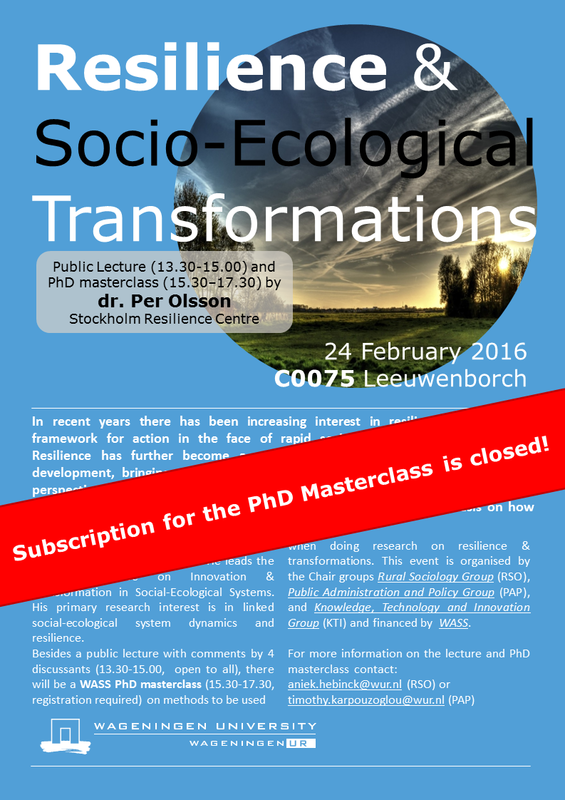 Per Olsson from the Stockholm Resilience Centre to visit Wageningen and give a public lecture on the 24th of February. He will give a public lecture on his primary field of research which is focussed on linked socio-ecological system dynamics and resilience. In this lecture he will be putting sustainability transitions central, while discussants from the groups RSO, KTI and PAP will reflect on the lecture taking their own research in mind.